This project led by Scheme Client Partner, Highways England, is the first major infrastructure project to be recognised as an Ultra Site. Being part of an Ultra Site has proved to be a positive driving force on this project, as it has provided a cohesive framework for contractors and the entire supply chain to work to the same high standards. Mark Berg, Project Director for A14 IDT Cambridge to Huntingdon Bypass said: “Being part of the CCS Ultra Site is important to the Integrated Delivery Team. Working with the Ultra Site, in particular working with our supply chain, allows us to push the boundaries, the capability and capacity of our supply chain. Watch the video below to find out more about this Ultra Site. UK’s biggest road construction project. 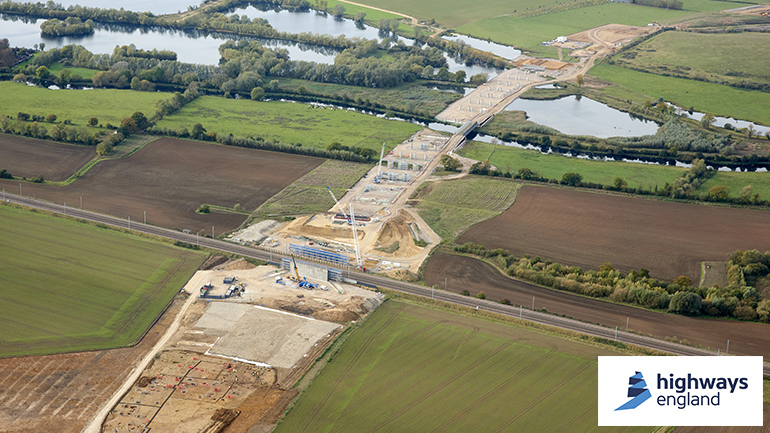 Upgrade of 21 miles of the A14 between Cambridge and Huntingdon.